After wrapping up its first Denver outing this weekend, the DreamHack tournament series awarded the champions of their various fighting game events with unique trophies that featured moving parts and the logo of each respective title. Unfortunately, these prizes soon began to fall apart. These problems were first brought to light on Sunday afternoon by Super Smash Bros. for Wii U champion Gonzalo “ZeRo” Barrios, who Tweeted a photo showing his trophy split in two. A few hours later, Super Smash Bros. Melee champion Juan “Hungrybox” DeBiedma shared a similarly heartbreaking story. And, as Johnny “S2J” Kim soon found out, these problems weren’t confined to the elaborate championship trophies. 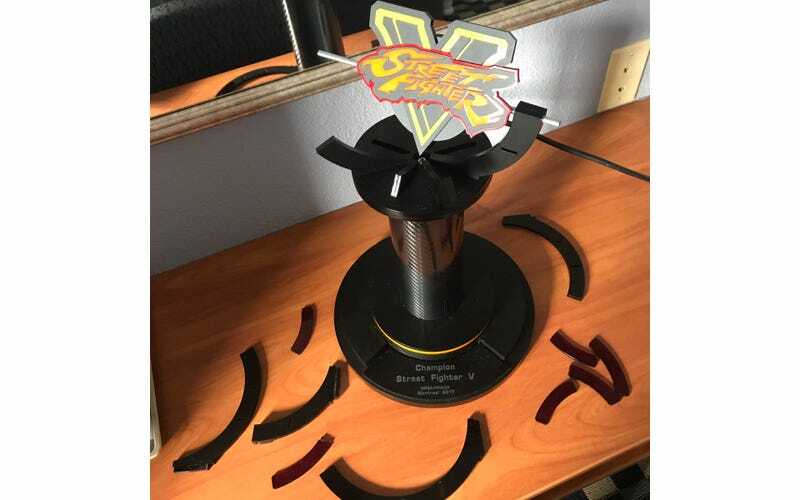 His prize for a fourth-place Melee finish, a simpler piece without any moving parts, also broke after the tournament’s conclusion. As widespread as this epidemic seemed, it soon became apparent that these tragic events weren’t new occurrences at DreamHack events. Du “NuckleDu” Dang and Edgard “n0ne” Sheleby, who won Street Fighter V and Super Smash Bros. Melee respectively at September’s DreamHack Montreal, saw their trophies crumble apart, and DreamHack Atlanta’s Melee champion Justin “Plup” McGrath traveled home in July with a broken trophy of his own. While it was obvious extraneous circumstances like airplane seat changes, awkward high-fives, and even dabbing led to some of these accidents, one would assume an event series as prestigious as DreamHack would award keepsakes made of sturdier stuff. Speaking with Compete, DreamHack fighting game tournament director Alex Jebailey confirmed that they will “definitely” be offering replacements to the Denver champions. Competitors are taking the issue in stride. The Scar and Toph Show, a popular Smash podcast hosted by Bobby “Scar” Scarnewman and Kris “Toph” Aldenderfer, asked if someone can even be a DreamHack finalist without a broken trophy, while Dang, who followed up his Montreal victory with a win in Denver, wondered if the prize he received was real when it stayed in one piece. That said, Jebailey also promised he will personally ensure they don’t use the same complex trophies at future events, saying that while they are “amazing designs,” the transportation difficulties they have given rise to over the past few months make them more trouble than they’re worth.